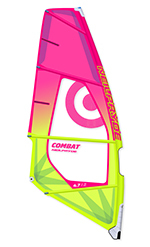 The Combat remains in the Neil Pryde line up as their 4-batten “All-Round Wave” sail for use in any wave sailing environment. The main refinements for the new season are seen in the materials used and the sail’s batten pocket construction. Using double stitching as standard in critical areas, Pryde have developed their own ‘Powerfuse’ laminate materials, enabling them to dispense with the patch reinforcements of old and thereby reduce weight without compromising strength. The battens are then integrated into the sail’s cloth (a process Pryde are calling ‘Fuse Pockets’), again reducing weight, and with the added bonus of ensuring symmetry between tacks. New also for 2018 are some rigging guides in the sail’s upper panel, clearly displaying the wide tuning range recommended for the new Combat. Whilst there’s a Heavy Duty Combat available, using x-ply scrim in the window panel, we’re testing the standard version in its sole, bright, distinctive colour scheme. Rigged on a TPX100 RDM mast, its set is flawless as we’ve come to expect from Pryde sails – not a wrinkle or crease in sight. Set for light winds, there is a good degree of shape to the sail’s draft, the battens sitting level with the leading edge of the mast, whilst the leech displays only moderate looseness in the top two panels. On the water this entrusts the Combat with a good amount of bottom end drive, feeling forceful and positive in the hands the moment a gust hits. Delivering the energy efficiently to the board, it has a very active and definite character – exacting power without being too sharp or critical. It settles quickly into a comfortable stance, the centre of effort pin-pointed around the rider. As such, the Combat can provide crisp instantaneous response – any shift in body weight and the sail will mirror the movement. In the past, this immediacy often became too much of a handful, particularly when the conditions turned on. And yet, the Combat has a good deal of play in the luff sleeve, which helps to take the edge off any stinging feedback as you pick your way out through heavy seas. 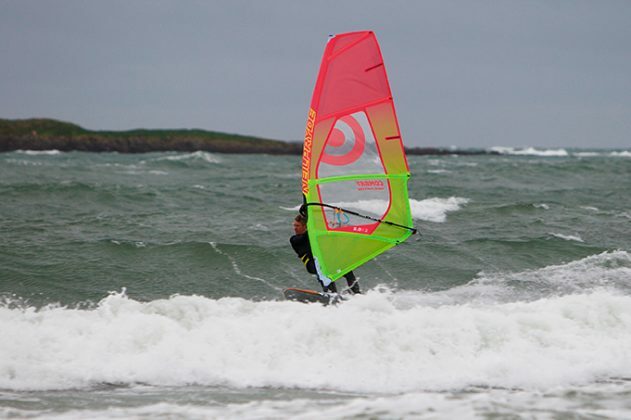 It also provides a little give and finesse when repositioning the sail mid-transition. Downhaul the sail for high winds and the leech opens up … the sail’s profile softens and yet the movement available in the luff sleeve remains. With its increased stability the power remains locked steadfastly next to the rider, the tangible acceleration in the hands through every gust quickly swelling the confidence of the aspiring rider. The 2018 Combat supplies the performance to match its standout visuals, delivering decisive, clear-cut yet accessible power over a mammoth tuneable wind range.